Baby is Waking Up and Staying Awake at Night? Here's What to Do! 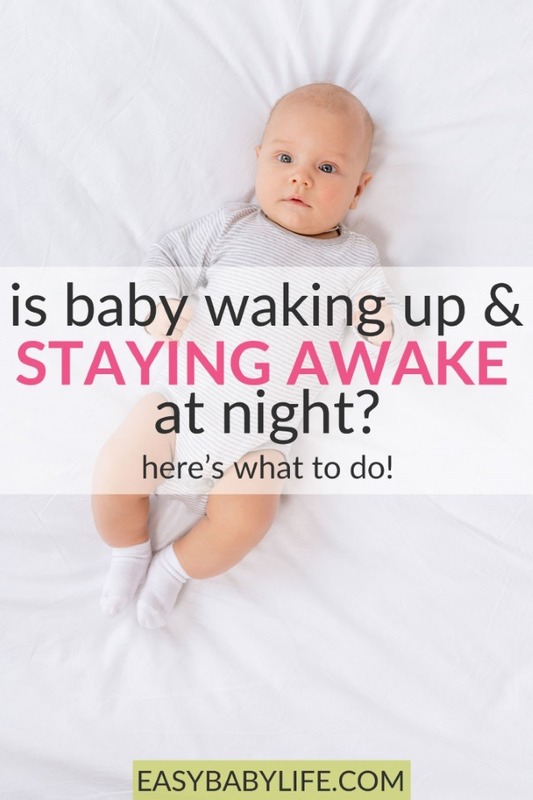 Home > Baby Helpline > Baby Sleep Questions > Baby is Waking Up and Staying Awake at Night? Here’s What to Do! My four and a half-month-old son wakes up every night between midnight and 2 AM and refuses to go back to sleep! Our attempts at trying to get him to sleep just seem to frustrate him and he ends up screaming non-stop from tiredness. He is not interested in drinking a bottle, nor sucking his pacifier. This has been going on for about a month now and I don’t know what to do anymore!! I’d be so grateful for any tips on what to do! First of all, have a look at this baby sleep schedule. See if your baby’s sleep habits are more or less in line with the schedule. If your baby sleeps a lot more during the day, this can be a reason for his waking up in the middle of the night. Babies also need enough daylight during the day for their bodies to really separate day from night. Never draw the curtains for naps during the day and get your baby outside as much as possible or at least close to a window (for example while feeding) during the day too. Read more here about tips when a baby has day and night mixed up. If there’s nothing to fix regarding the sleep schedule, the next thing to review is the sleep environment. Is the room really dark at night? Is he full when he goes to bed? Not too cold or too warm? Is there a risk that you disturb him when you go to bed? Some babies wake up because their parents start talking, put the lights on or snore loudly next to where they sleep. My children always slept better in a baby sleep bag, like this one (link to Amazon), than under a blanket. 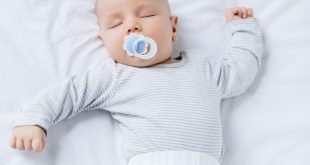 If the sleep environment is fine too, then consider how you put your baby to sleep. Maybe it is time to help him fall asleep on his own if he doesn’t already? This is usually quite an effective way to help babies help themselves go back to sleep at night if they wake up. You can for example either use the stroller to rock him to sleep instead of in your arms or put him in his bed or in your bed lying next to him rather than having him in your arms. I’m not fond at all of the cry-it-out method personally. There are other ways! Take it gradually and lift him up if he gets frustrated, help him calm down and then put him down again. If you do use the stroller (and if you have a safe stroller where he can’t fall out), you can try keeping him in the stroller for a couple of nights. The second you hear that he starts waking up, start pushing the stroller back and forth to make him go back to sleep. This can be an effective way to break his nighttime habits. The great thing about this method is that you can take turns. When my son started waking up at 4 months old, I used the stroller. After 3 nights he slept for 8 hours without a sound. But he was quite used to falling asleep in the stroller for naps, so that is the first step. Add your comments below or return to Baby Sleep Q&A.